We are successfully ranked amongst the trustworthy entities offering a wide range of Oil Resistant Conveyor Belt. This belt having textile plies is specially designed for the industry whose conveyors carry mineral vegetables, animal oils, and fats. The provided belt has a high resistance to friction and atmospheric conditions, which enable clients to install the belt in the heavy duty conveyors. 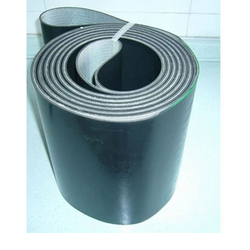 To order this type of belt, the client must specify the oil’s type and composition, details on temperature conditions, and previously used belts. Looking for Oil Resistant Conveyor Belt ?